Though Detroit’s become a signpost for where the rest of America is heading unless we change our ways right quick, there was a time when it was vital. So vital, in fact, that Detroit produced music so blazingly good that it became a sound track of the American empire at its height. That, of course, was the sound of Motown. Last night The Temptations performed here in northern Michigan. One of the premier groups that Motown founder and chief executive Berry Gordy Jr. recruited to the label’s talented stable of African American artists, The Temptations turned out hit after hit that transcended race, class, and generations. That surely was evident last night as a good size audience of 2,500, teens to the elderly, were taken smoothly through a dance and song repertoire that included “I Can’t Get Next To You” (1969), “Papa Was A Rolling Stone” (1972), “The Way You Do The Things You Do” (1964), “My Girl” (1964), “I Wish It Would Rain” (1967), “Aint Too Proud To Beg” (1966), and a few more that I can’t recall. I was looking for “Cloud Nine” (1968) and “Psychedelic Shack” (1970), the latter which I first heard on Ed Sullivan that same year, but alas. The playlist is way too long for a single show. Otis Wilson, who’s been with the Temps since its founding by Gordy in 1961, is the only original member, though the other four — Ron Tyson, Terry Weeks, Joe Herndon, and Bruce Williamson — have a combined 54 years of experience. The show is really strong — made more so because the Temps have the good sense to tour with a four-piece rhythm and guitar section, and a 10-piece horn section. For fans of Motown, the music still has no real match in memorable second-half 20th century melody and lyrics other than, arguably, the Beatles or the Stones. At its height in the 1960s and early 1970s, Motown was the most influential and popular independent record company in history. Motown’s modest blue and white headquarters on West Grand Boulevard, which Gordy named Hitsville U.S.A., was a hive of creative energy, attended to by a glittering ensemble of world-renown male and female singing groups and solo acts – the Supremes, The Temptations, the Miracles, the Four Tops, Martha and the Vandellas, Gladys Knight and the Pips, Marvin Gaye, Stevie Wonder, and the Jackson Five. Motown’s catalog is a treasure trove of tender lyrics, irresistible melodies, and compelling grooves — many of which Gordy helped to write and produce. Nearly all of Motown’s top groups and individual artists became household names, and 11 became members of the Rock and Roll Hall of Fame, including the Temp’s Otis Wilson. 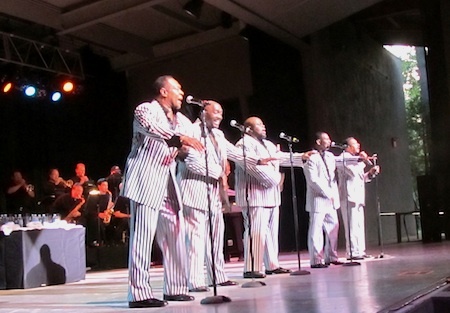 The company’s numerous biographers, including several former staff members, consistently reported that the real strength of Motown was the culture of competition and perfectionism that Gordy fostered in his peerless stable of producers and songwriters — Brian Holland, Lamont Dozier, Eddie Holland, Norman Whitfield, Barrett Strong, and Smokey Robinson. Blending elements of gospel, rhythm and blues, and soul, Motown’s singers, musicians, and producers arrived at the cramped West Grand Boulevard recording studio around the clock for three-hour recording sessions, yielding what Gordy called “the sound of young America.” Of the 537 singles issued by Motown in the 1960s, 357 were hits. History would eventually show that Motown actually produced some of the anthems for an era in black and white America that began with the promise of President Kennedy’s optimistic new frontier powered by prosperity, new technology, and civil rights. Seeing The Temptations last night was a rite of connection to that time.